Babymouse loves Valentines Day! A day for pink hearts! Flowers! Candy! School dances and romance . . . sweet romance! WAIT! Romance? Ew! And what's this about a school dance? Does that mean Babymouse needs a date? Uh-oh! Looks like this Valentine's Day may turn into a Valentine's dud! Will Babymouse go to the school dance? Will she get any Valentines? Will she find true love? Find out in . 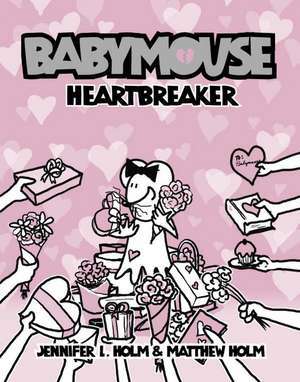 . . Heartbreaker—the 5th hilarious, action-packed installment of the beloved Babymouse graphic novel series! Here's what people are saying about Babymouse! Brother-and-sister team, Matthew Holm and Jennifer L. Holm have had their share of school dance dramas. Today, Jennifer is the New York Times bestselling author of several highly acclaimed novels, including three Newbery Honor-winners, Our Only May Amelia, Penny from Heaven, and Turtle in Paradise. Matthew Holm is a graphic designer and freelance writer. They are both happily married and avoid dancing at all costs. Matthew and Jennifer live in Fallston, Maryland, and Hudson, New York, respectively.